If you’re reading this and have started a blog or want to start a blog then you are doing it for more than just a hobby. You want to make some money with your blog. There is absolutely nothing wrong with that. We all need money to live our lives and blogging can be a great way to earn that money. It isn’t necessarily an easy way to make money but that doesn’t mean it is hard either. In fact, people like me can sometimes make it seem too easy. It’s #3 that seems to have a lot of people stumped. They have ads, affiliate links, and products all over their site, they should be raking it in, but they aren’t. It can be a number of things that often get overlooked. One of the biggest problems that blogger’s face is that they are looking at their blog daily so they don’t notice the things that need to be improved. It’s similar to trying to lose weight. You don’t notice changes if you continue to look at yourself in the mirror daily, but if you check out a photo from a couple months back you will see the difference. In this post, I will outline some of the things that can be holding you back from making money on your blog. Even the most screwed up car dealership makes sure that their cars look good. You need to instill trust in your audience if you want them to purchase anything. This can often start with the design of your site. When I launched Obstacle.co I made sure that the design was pretty good because I knew I had an uphill battle to make money. The design and content helped me land a couple of clients that served as the first income this site made. Now when I tell people that I can teach them how to do well on Pinterest or build their audience I know that the design of the site will give them the impression that I might have some idea that I know what I’m talking about. If you need some pointers on how to improve your blog’s homepage design check out 9 Jaw-Dropping Homepage Designs You Should Steal Ideas From. Some bloggers don’t sell enough and some sell too often. If you have products that you created that you want people to buy then you need to ask them to buy those products. You don’t get what you ask for. Be proud of what you created and share it to the high heavens, but don’t go overboard. I wonder that the product is this time? Your audience should love your products, but they should also love everything else that you do. You do other things right? Like…write awesome blog posts or host super webinars? Of course, you do so talk about those things. Something big happening in your life? Don’t hesitate to share it. Your communication with your audience shouldn’t only be in the form of sales pitches. But when you are ready to sell something then make sure you sell the hell out of it. Let’s face it, not every niche is the same. The reason why you see so many blogs teaching you how to make money is because the audience of that niche is willing to pay a premium on products that teach them how to make money. You probably can’t get away charging $499 for a course on gardening, but that doesn’t mean you can’t charge something. However, there are probably some niches where people don’t expect to spend any money. I don’t know any of these but I don’t want to say that you can make money in any niche. This one is a tough pill for me to swallow because I want to help as many people as I can. To do that I could make everything free but that isn’t realistic. The next thing I can do is make it really cheap and hope to make up the lost revenue in volume. That could very well work out in the long-term, but doesn’t help out much in the short term. So what you should do (as all business advice points to) is find the optimal price that gives you the most revenue. You won’t find this right away but after a couple of product launches, you’ll have a better feel for your audience. If everyone is scooping up a product then you are probably losing out on money because it is too cheap. If not enough (or nobody) is buying your product then it’s priced too high. It’s easier to sell a lower cost product because there is less of a financial commitment from a person, but there is also the chance you make a lot less. Let’s say I created a guide on how to install WordPress and charged $10 for it. Do you think I would make any money? I’d probably make some based on my brand, but odds are I won’t make much of anything. Because the guide would solve a problem that many people don’t feel the need to pay for. How many people are out there struggling to get WordPress installed on their web server? This is why it is risky to make a product before you understand the problems that your audience is trying to solve. The most successful service I’ve sold is called the Blog Takeover. I never envisioned that I would create a service like this when I started Obstacle.co. It only came about after a number of talks with folks in my audience. When I realized that some people didn’t want to take courses to help grow their blog. They wanted a partner to help them get there in a way that is unique to them. Spend some time getting to know your audience by having conversations with them. Talking to them will always be the best way to get to know people. Making money all comes down to presenting your solution to the person that has the problem and is willing to pay for the solution. Just because people visit your blog and like what you write about it doesn’t mean they are the audience for your product. It’s why people that sell to their mailing list are happy with 1% conversions. They know their product isn’t for everybody. If you’re hoping that people will buy your product the second they land on your site then your best bet is that you’ve found the people that have an immediate need to fix the problem. The problem has become so urgent to them that they are willing to pay whatever it takes to solve it. When it comes to selling products and services every customer goes through a sales cycle. What is this? This is why most of the time you won’t get sales from people that have just arrived on your site for the first time. This is why bloggers go through launch sequences for products because they understand they need to walk everyone through the sales cycle. With some smart maneuvering you can segment your mailing list into the different categories, but usually, you just find people that you think are interested in your product and then you push them through the sales cycle. This is a contentious point because Obstacle.co didn’t receive much traffic when it was making over $7,000 a month. However, because I was making money mostly through services the numbers are a little skewed. If you are selling products you need traffic. You need traffic because you need to convert people to your list and everybody that comes to your site is not going to join your list. The more people on your list the better your odds of making money. Don’t mistake this for needing a large list to make money. I’m simply saying that the bigger your audience, the better your chances of finding the right people to sell your products to. I’m totally ignoring ad-based revenue models here. Those are solely dependent on traffic and it doesn’t matter what kind of traffic. What I am talking about is getting the most targeted traffic you can possibly get so that you can build your mailing list. If you’re looking for ways to grow your blog check out 9 Easy Ways to Grow Your Blog. This one is important. If people don’t believe that you have the knowledge to teach whatever is in your product then they won’t buy it. I don’t have a course on Facebook Ads because I don’t have much experience with them so I can’t pose myself as an authority on the subject. If you are planning on creating a course or book on a topic then the best thing that you can do is write about it constantly. Let the world know that you know what the hell you are talking about. What happens if you enter the game not being an expert at anything? That’s okay. Just write about your journey learning something and you can create a book called My Journey Learning…. People are simply looking to you to teach them things that they didn’t know before. These aren’t all of the reasons why your blog isn’t making money but they are some of the major ones that people tend to overlook. Making money with a blog is not the easiest thing in the world but it isn’t impossible either. It really just comes down to understanding your audience and the problems that they are facing. If you want to find out how to get a better understanding of your and how to find your true fans then take my free course on Cultivating Your Tribe. 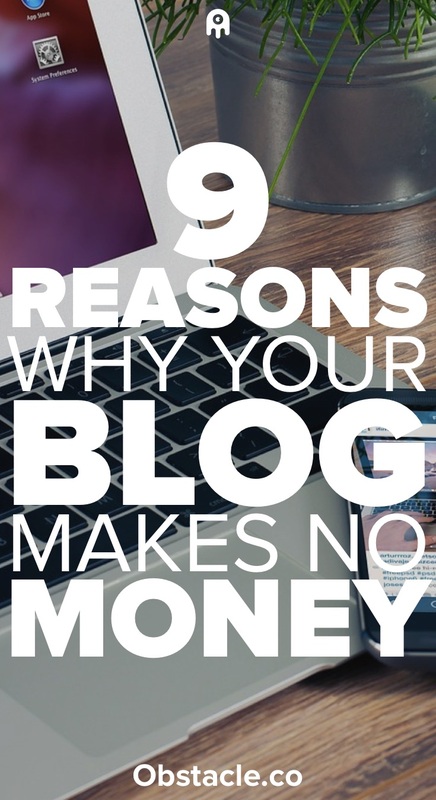 You don’t get what you don’t ask for so I’m asking you to take a second to share 9 Reasons Why Your Blog Makes No Money with your audience. They respect great content.